You were in quarantine in Trinidad at the young age of seven months and "served your time" well. I joked that, since Shelby was up to date on her rabies shots, couldn't we put the boys (then teenagers) in quarantine and the dog come home with us? They were not amused - neither the boys or the "Powers That Be" in Animal Control. You gained a following in Trinidad - especially with the Kramer's. Colleen would keep you often when we went to Texas and they treated you like royalty. You patrolled the grounds like one of the guards that were always outside our homes there. You had an innate desire to protect those whom you loved. You loved staying with the Littlefield's as well when we were in Port of Spain. You and Darcy, their Westie, were great pals. And you loved having young children to pay with in Joey and Kelsey. And Edie let you sleep at the foot of their bed, just like at home. Three and a-half years later, you flew again across the Atlantic to England, where, once again you entered quarantine for six months. This was before the Pet Passport Program. You and Patches, the Bryant's Cavalier, stayed in the same kennel, and Cynthia and I would come out together to spend time petting you, telling you what a good girl you were and "it won't be much longer". I do admit you wormed your way into the heart of the owner as you got preferential treatment - they were quite sad to see you go. But we'd board there so they got to spoil you again. Once, when you were very sick, one of the quarantine attendants took several buses at night to come and sit with you and feed you boiled chicken and pasta and make sure it stayed down because he was so worried about you. That was love. Once home, you thoroughly enjoyed having a HUGE yard to romp and play in. You'd "point" when the occasional deer or fox would race through the yard and bark to be let out. 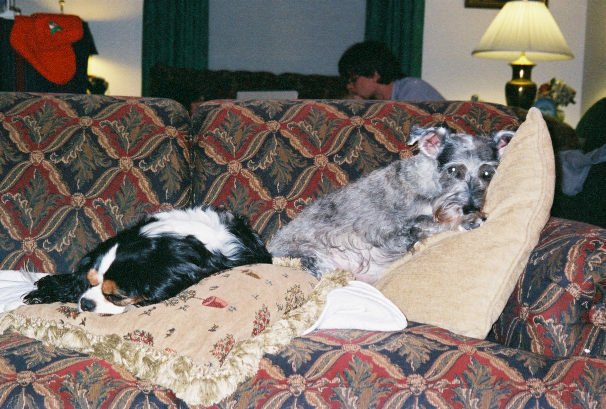 Everybody loved you (except perhaps the Bryant's one time when they kept you and you barked, and barked and barked again every time someone came to the door...you wore out your welcome that time, tootsie!) But you "liberated" Patches from the utility room where she slept since you slept at the foot of the bed! I believe Whitney felt it wasn't fair that Shelby got to sleep with her or Paige but Patches had to sleep downstairs - alone. You got your Pet Passport a couple of years later and traveled back and forth between the UK and Texas until you developed pancreatitis and your globe-trotting days were over. You lived alternately with Jennifer's family and then Tim's the months until we repatriate to Texas and could have you live with us again. You took in it your usual stride. Even where you boarded, Waggin' Tails, you quickly became the "Teacher's Pet" with Denise taking you with her when she ran errands - you have been to the Fulshear Post Office but I've never been! You were even in the Houston Chronicle when they ran a feature article about the kennel - you were one of four "guests" photographed with Denise. She's going to miss you something fierce too. You were a quick learner with house training. You loved to play with squeaky toys as long as they had plush on them! You loved playing tug-of-war with toys. And you were my shadow. You barked away strangers when I was alone in England and "Daddy" was in Africa. You scared off street vagrants in Trinidad where dogs are bred for security. Even though you weren't, you had a bark that meant business! But those you loved, you loved with an unselfish devotion. We will miss you, Shelby. You were the dog we got when the kids still lived at home. You were the dog who made it 15-1/2 years in our household despite quarantines, moves, different homes, different vets, different continents. You were a good Expat dog. You were my companion when "Daddy" was away on business trips. You were the dog who met every grandchild and endeared yourself to them as you allowed them to play with you (sometimes not very gently either) and put up with pulled ears, fierce hugs and sloppy kisses. You were our fourth, albeit hirsute, child. Rest in peace, dear one. And know you were loved. 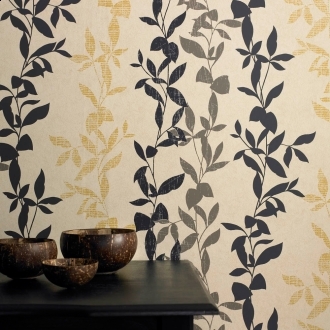 I swear I think I've seen this wallpaper before (and I can hear in my mind my mom saying, "Cheri! Don't swear!") I believe it was in the downstairs bathroom of the house we bought in Naperville, Illinois, back in 1981. I was pregnant up to my eyeballs when we transferred from Houston to Chicago for Mike's job. I was six weeks away from delivery and there I was, perched precariously on a ladder, removing a wallpaper very similar to this in that bathroom right after we'd closed on the house. Everything about it screamed "SEVENTIES!!" in loud, punctuated, tenacious tones. Metallic gold accents...shudder! So when I saw this online today - ON SALE for $59.95 per roll down from $89.95 - I was aghast! There are just some historical (and I use that term loosely since it was only 30 years ago - that makes it more "vintage" than historical) trends that do not bear repeating. They should be buried and forgotten. But I am sure there are others who beg to differ. And most of those others, I'd wager (and NOW I can here my mom saying, "Cheri! Don't gamble!") are in their 20's and 30's, passionately in love with all things '70s. I say that because there are so many people who have embraced "mid-century" furniture. the stuff I grew up with - in the '60s because it was hand-me-downs that my folks had been able to procure on their lean budget. Blond woods, sharp edges, lots of aluminum banding (I'm thinking of our kitchen table now), Formica laminate tops (tables, counters, bathrooms), modular looking upholstered pieces. My mom hates it to this day - and so do I frankly. I'm not sure why exactly but it wasn't "comforting" design and we both crave an environment that says, "Come in, sit down, put your feet up, be comfortable". And most of our 50s stuff was the antithesis of that. To each his own. And ones interiors should speak to them personally. Which is why, when I saw this, it said to me, "Na-na-nanana!" And I shuddered. I don't like being taunted by wallpaper. Okay, maybe not so impressive/important as "Remember the Alamo!" but, if you win, you WILL get this gorgeous quilt, made by my friend Sherri. Those of you who were overseas in Trinidad and England with us (Amoco/BP days) probably even know her. All those years I knew her, working to make a better international school, breaking leases on bad properties, collecting Polish Pottery, drinking Starbucks at Sainsbury's, keeping each other sane - I never knew her secret talent! Only in the last year or so do I discover, after we moved to different parts of the globe, that the woman has mad sewing skills! (or is that "skilz"? Nope, I'm too old for that...) Anyway, go to her daughter's blog and be sure to leave a comment as your entry. 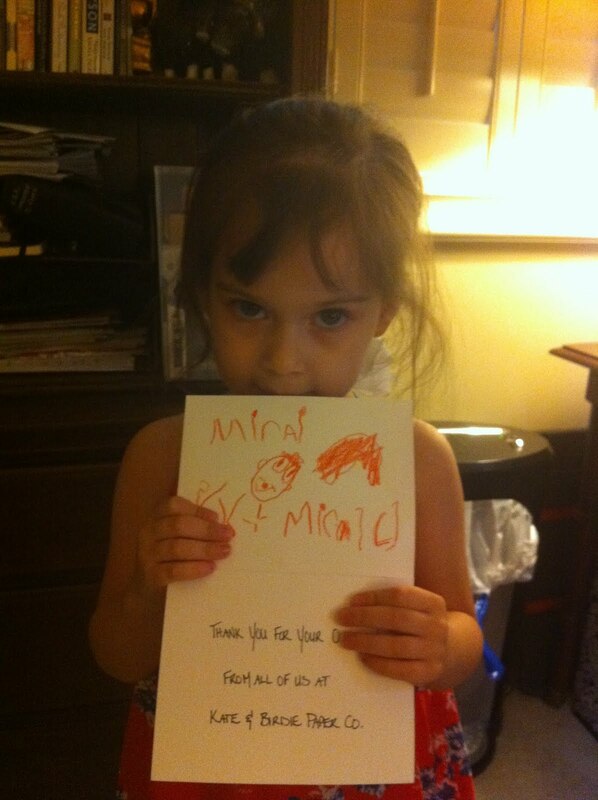 And she not only wrote it once but TWICE (and a cute picture to go with it)! Okay, so we need to work on "lower case" vs "upper case". Should I get the university apps ready? Probably premature, but I'm so pleased just the same. And I love how her pictures of people always have a nose and big SMILES on their faces! She starts pre-kindergarten in September with three days a week instead of the two last year. I can tell her brain is really clicking as she thinks things through now. She'll get this furrow in her brow, look away into the distance for a minute in concentration, then her face clears, she makes eye contact and, with a big old smile on her face, she imparts her new knowledge to you! Big doin's happening this year, folks; BIG doin's. Meanwhile, I'm working on my "preschoolers wardrobe" acquisition addiction. More on that in another blog. Let's just say a girl can never have too many shoes (or the outfits to go with them) or hair bows, right? A dear friend of mine from our overseas days, Sherri, quilts like nobody's business. I have several of her creations and I like to call their style "Contemporary Classic" as they are contemporary colors and fabric prints but traditional style blocking and composition. She uses only high quality long-staple cotton fabrics. I own, let's see - 4 baby, 1 twin and 1 throw quilt plus a toddler sized bed quilt that she's made and sold on Etsy. Well, (drum roll please!) THIS weekend, she is giving one away through her daughter's blog, "My Two Red Shoes". And it's a BEAUT! Lavender, blues and soft greens. If it were mine, I'd be tempted to call it Lavender Blue (Dilly Dilly) but, knowing Sherri, she's probably already named it and will have a sewn in embroidered tag with the name on it. You can read the entry rules on Kathleen's blog but basically, you can enter once a day from today through Sunday plus a bonus entry if you mention the giveaway in YOUR blog, referencing it back to her and leaving a comment with a link to YOUR blog! I'm trying not to covet this but it's hard - this is a DILLY of a quilt and my wishing vibes are going all out right now! On second thought, maybe you SHOULDN'T enter as that leaves more chances for me! Nope, you gotta enter and tell your blog friends about it. I can attest to the supreme quality of this quilt - they wash up beautifully in the washer and dryer (I've never had shrinkage issues) and they end up very soft and "drape-y" (I hate a stiff quilt that doesn't mold to you when under it - these are GREAT "drapers"). Well, what are waiting around here for? Go ENTER!